We rescheduled last Saturday's GRAND OPENING festivities when Mother Nature wasn't cooperating with us. Come aboard to say hello, tour our boat to check out the renovations & relax on deck! Come aboard our GRAND OPENING CRUISE and heed Van Morrison's call to "Smell the sea and see the sky / Let your soul and spirit fly into the mystic." Revel in the sunset and then get lost in the wonder of night sky. 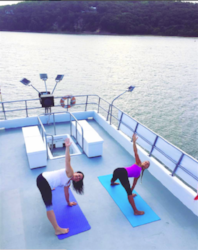 Gaze at the bay and breathe in the sea air from our upper deck as you practice a combination of Hatha and Vinyasa yoga with Meg the Mermaid Yogi. All levels welcome! Bring a mat or use one of ours. $25 pp || Class limited to 12. RSVP early. Come aboard this cruise and visit Captain Will in the wheelhouse! Kids are invited to sit in the helm chair (great photo ops!) and might even get a lesson on how to steer the boat! Our "Captain's Kid Cruise" is filled with family memories waiting to be made. Spending time on the water together is a great way to reconnect and enjoy being on the bay being surrounded by the beauty of the North Fork. WITH optional PRE-CRUISE DOCKTAIL PARTY! Come aboard for a special Sunset & Stargazers passenger Docktail Party. Then, cruise with us to revel in the sunset before getting lost in the wonder of the night sky.